PerfectPleat HC M8 - Joe W. Fly Co., Inc. 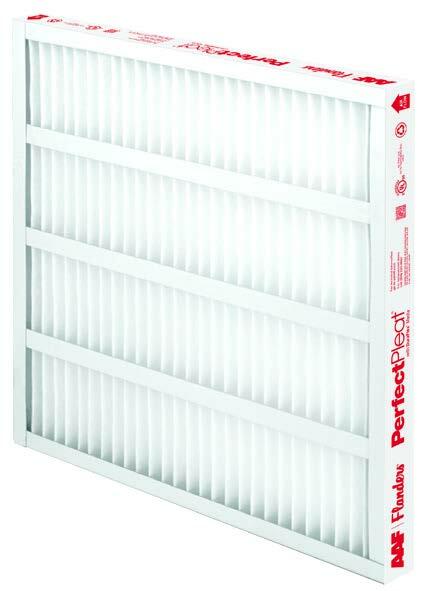 The PerfectPleat HC M8 filter is designed to consistently increase efficiency throughout the service life of the filter. The PerfectPleat HC M8 filter has approximately 25% more media than our standard capacity filter, and is ideal for applications where pleated filters are currently in use and higher performance is desired. They have an initial MERV 8 rating respectively, but the efficiency increases significantly when dust holding begins. PerfectPleat HC M8 filters have distinctive self-supporting characteristics that allow a pleating pattern, which promotes airflow and maximizes dust holding capacity (DHC). Lower pressure drop and higher DHC means reductions in energy consumption and operating costs.